Recently, I have mentioned some fMRI studies investigating which brain areas are involved in self-determined (autonomously motivated) and non-self-determined (forced, non-volitional) behavior. In this post I'll try to summarize these findings in a pictures of the brain. First I'll summarize the findings in words. Woogul Lee and his colleagues (Lee, 2011; Lee & Reeve, 2012, Lee et al., 2013) investigated the differences in brain activation for behaviors which were self-determined based on intrinsic motivation and non-self-determined behaviors based on extrinsic motivation (such as rewards). They found that the anterior insular cortex (AIC) was more active during the self-determined (intrinsically motivated) behaviors. The posterior cingulate cortex (PCC) and the angular gyrus were more active during non-self-determined (extrinsically motivated) behaviors. The ventral striatum was more active while doing interesting tasks. Leotti and Delgado (2011) showed that anticipation of choice leads to more activity in the dorsal ACC, insula, ventral pallidum, and midbrain. These findings were replicated by Murayama et al. (2013) who examined the differences in brain activity between participants doing a game-like task in self-determined choice condition and participants in a forced-choice condition (for more details read this). 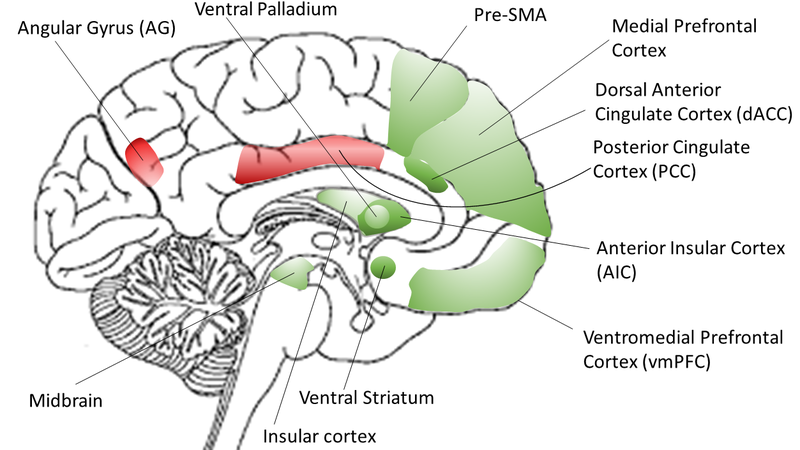 The self-determined-choice cue activated the dorsal ACC (extending into the medial prefrontal cortex and presupplementary motor area, pre-SMA), anterior insula, and midbrain more strongly than did the forced-choice cue. Also, when participants were confronted with failure feedback, there was a drop in vmPFC activation in the forced-choice condition, but not in the selfdetermined-choice condition. The picture below shows a sagittal (from front to back) cross section of the brain. I've indicated the approximate locations of the above mentioned areas. Areas which are associated with self-determined behaviors are colored green; those associated with non-self-determined behaviors are colored red.